The Impact 6" End Jaw Vise Grip provides strong, solid gripping of round, square, or rectangular tubing and many other common or irregular shapes. At one end of the steel shaft are the fixed end jaws and at the other a 5/8" Baby pin for mounting fixtures or other grip items. Box Dimensions (LxWxH) 13.4 x 3.9 x 3.85"
6" End Jaw Vise Grip is rated 4.4 out of 5 by 14. Rated 4 out of 5 by Tim from Impact VS Matthews End Jaw Clamps I own both the Impact and the Matthews versions of these clamps. They are fairly similar, although neither is a true 6" in length. The main difference that I see is that the Impact version is machined with a groove that runs through the length of the threads and keeps the jaws in alignment. The Matthews does not have this groove, and the lower jaw rotates freely. In use, it is possible to flick the Matthews handle and it will spin up the tread a few inches. When the handle of the Impact is flicked, it only travels a couple of spins before friction stops it. Basically, the Matthews is much quicker to tighten, while the Impact requires no effort to align the jaws. Rated 5 out of 5 by Keven from Good Solid Clamp Good design and build quality. Jaw is rubber lined to keep from scratching stuff up. V-notch works well for gripping round things. This thing looks like it could support 1000 lbs. They call it a 6" but the jaws on mine open to a full 8". One little quirk is that when you go to un-clamp, the jaws stay tight when you back off the spinner. This may be a design feature but you have to give the shaft a little wiggle and it will release. I have 2 and will get more. You can clamp on to the lower part of a light stand to add a second speedlight with modifier down low to get the illusion of a huge soft box or to use as an independent flash to fill shadows. Rated 5 out of 5 by Time Saver from Versatile Jaw Grip I am using this Jaw Grip in a rather unconventional way. I recently purchased a Flanders Scientific DM240 with the C Stand mount and in an effort to reduce the workload when moving the monitor from filming studio to Color Correcting Suite, I decided to try this Jaw Grip out as a desk stand. I have to say that it has worked beautifully. It allows me to quickly and easily remove the monitor from my desk and drop it onto a rolling c stand. Not sure anyone else is doing this but I suggest giving it a try if you have a suite and a studio in close proximity. Rated 3 out of 5 by Jeff from Not the same quality as the Matthews clamp! I ordered three of these and returned them and ordered the same style in a Matthews clamp. Matthews Matthellini Clamp with 6 End Jaw which is the same price. The machining on the threads is not as good as it is on all my Matthew clamps. I can spin the the clamp down knob and it continues to spin easily and quickly. Not the same with the Impact clamp. When your holding a heavy fixture and trying to mount it, being able to spin down the tightening knob makes the operation a lot easier. I also noticed the rubber in the jaw clamps hold more solidly on the Matthew clamps. I compared all 3 Impact clamps, they all took more effort and time to tighten. I had to really crank the impact clamps down to grip a support to keep them from moving. Rated 5 out of 5 by Scott from Great Multi Purpose Clamp I purchased the Impact 6" Cardellini clamp to hold a Quasar Science 4' LED tube. This works perfect for this. The Quasar Science LED tube looks like a fluorescent tube, but is LED. You don't need a fixture for the LED tube. The best thing is to hold it using a Cardellini clamp. This clamp works great. The jaws are 3-inches long and hold well. The clamp is a nice chrome covered clamp. The screw adjustment is large and works well. My only complaint is that the threads go a long way and when you mount the stud end in a C-Stand grip clamp you bite a little bit of the threads. I wish the threads didn't go so far and had more of the smooth stud end. But, it isn't a big deal. This clamp is also good for attaching to a pipe or door to use as a light mount. It works well and is very useful. B&H has a good price and it is well made. Rated 5 out of 5 by David from Cost Effective As an independent contractor I provide all my own gear. Cost and quality are big factors when deciding to purchase any piece of gear. Impact's line of grip/gaffer gear is great! They're every bit as strong and sturdy as the much higher priced ones. 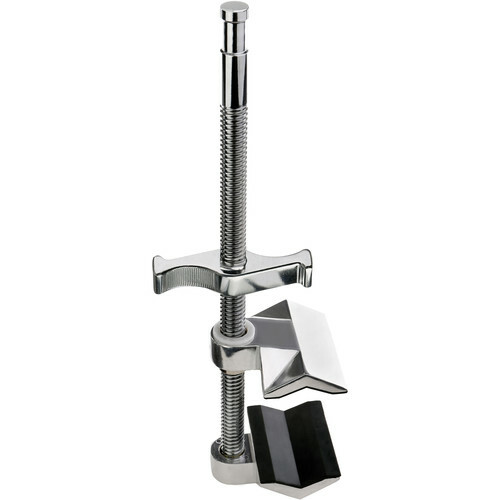 This Cartelinni style clamp is excellent. Rated 5 out of 5 by Miyuki from Solid purchase! I bought this jaw grip to use with my new beauty dish and it works GREAT! It's super strong and so tight that sometimes it's difficult to loosen it haha. I'm so glad I got it!